Do we actually know or understand fully what adolescent athletes want or need? So, why did I start this research with this age grade within rugby union….? Being a father first and having a son whom has picked up and fallen out of love for rugby union now three times, we sat down and discussed reasons why he became disenchanted with the game I cherished so much. A lot of this stemmed from coaching ideas and practices, non-harmonious coaching practices and lack of enjoyment through intensive, regimented practices with less play or game-based environments. Therefore, I started to consider ideas how I as a coach, parent, practitioner and research student could offer new ideas or perspectives for age grade players coming through and the environments they are learning and developing in, having been involved in Rugby Australia age grade programs and Colts programs across Brisbane rugby for 10 years. I started looking at elite age grade athletes and adolescent behaviours in general. Erikson (1968) recognised that adolescents are entering a stage of development where they are strengthening their views towards their identity; who they are, what they are about and where they are going in life. Psychologists such as Cote (2009) and Arnett (2006) disputed this extended into early adulthood yet both ages were applicable to my research and the players involved in the programs I was investigating. Arnett also looked at the instability through changing circumstances and greater levels of self-focus due to increased autonomy as areas within early adulthood, starting around 18 years of age. However, if these ideas of identity exploration are discovered in a healthy manner and arrive at a positive path to follow, they shall more likely achieve a positive identity. Therefore, why do we as sports coaches think this doesn’t extend to between the white lines of our sports pitches? Adolescents unsurprisingly experience many cognitive changes at this stage; Kuhn (2009) believes one of the most important is the improvement in executive functioning, which involves higher order cognitive activities such as reasoning, decision making and monitoring progress improvements to permit more effective learning and engage in critical thinking. Schaie and Willis (200) also believed early adults (18+ year olds) progress in their use of intellect and Commons and Bresette’s research (2006) seen a switch from acquiring knowledge to applying knowledge and move to postformal thought, where more reflective thinking is needed to answer problems when emotions and subjective factors effect decisions. Again, why do we as sports coaches think this doesn’t extend to between the white lines of our sports pitches?? Us as coaches, parents or mentors offering opportunity for adolescents to improve critical thinking could assist increased breadth of knowledge in adopted areas of interest, greater range and more spontaneous use of strategies for applying or obtaining knowledge and increased speed and capacity of information processing, freeing cognitive resources for other purposes. I believe in all sports, yet especially dynamic team sports, the development of these skills would be important as part of sports and personal development and highly desired in elite levels. Piaget addressed that adolescents develop images of ideal circumstances as they move beyond concrete experiences and think about abstract and more logical terms, solving problems in systematic fashion and testing developed hypotheses. People and players in this example start to have thoughts towards idealism and ideal characteristics in themselves and others, creating largely healthy comparisons against these standards. This supports some of my previous writing where I believe sports coaching has become overly prescriptive at this age grade level as opposed to creating competitive yet creative atmospheres where players drive the discovery and tone of development. Most psychologists acknowledge the increased push for autonomy and responsibility amongst adolescents. We as coaches, parents or practitioners should relinquish some control in areas where players can make reasonable or safe decisions yet recognise minor disputes and negotiations by players or adolescents in general serve as positive developmental functions from being dependent to an autonomous individual. However, this age of athletes also experiences rapid changes to social development neuroscience proven by research such as Nelson (2003) whom explained regarding brain development where adolescents are capable of strong emotions, yet their prefrontal cortex hasn’t developed a point of controlling emotions; combined with mismatch of developing physical body structures, this can heighten the identity crisis as researched by Erikson. Another area of importance is acknowledging social media has a big part to play within adolescents and early adults’ lives, shaping their friendship circles and personal view on themselves and people around them. Research by Bukowski, Motzoi and Meyer (2009) found that adolescents depend more of friends to satisfy needs for companionship, reassurance of worth and intimacy. However, boys with more or higher number of online friends showed lower self-esteem and increased loneliness (Donchi and Moore, 2004) while face to face friendships had a greater effect and improvement on wellbeing with males; this shall be highlighted when looking at intimacy strivings, which are typical goals that express desire for close, reciprocal relationships, in my research details. Within social media, Valkenburg and Peter (2009) found that approximately 1 in 3 adolescents self-disclose their thoughts and feeling better online than in person, with boys reported as more comfortable and probably larger ratio. However, I believe social media is also one of the causes for increased adolescent egocentrism; Elkind (1976) looked at heightened self-conscious of adolescents through key components of imaginary audience and personal fable. Personal fable looks at the part of egocentrism that involves an adolescent’s sense of uniqueness invincibility or invulnerability while, more prevalent, looks at imaginary audience where adolescents believe that others are interested in them as they see themselves, increasing a desire to be noticed, visible and on stage. This area of imaginary audience come back to areas I’ve previously discussed of mindset (whether players have or are encouraged to develop growth mindset over fixed) and their goal alignment. Players aligned with task involvement goals, whom judge their competency through self-referenced targets or goals, are recognised as evoking high effort to obtain mastery and continually improve personal performance. Their ability and effort are not differentiated by others and the perceived ability is self-determined and success only realised when mastery is achieved. Ego involvement or orientation shows athletes more concerned with their evaluation against normative standards and recognise success as measurement against others, which is now infinity more conman in the world of social media, when performing as equal as others with less effort; therefore, not displaying striving for mastery or being focused on task. These players have ego-based goals and they differentiate their effort and perceived ability, based on social aspects surrounding them, again displaying the lack the patience and effort required to find these desired emotions like suggested by Simon Sinek when talking about Millennials. With all this information, other research including Cote and colleagues’ developmental model of sport participation, self-determination theory and positive youth development, personal desire to research and offer perspectives in mind, I began my research into why elite age grade rugby union players play their sport and what they look for from their environments and coaches, by ways of motivation, emotional support and learning assistance throughout these critical years of development. Additional to my background within the sport, I wanted to investigate players who are entering both a perceived period of sport specialisation and new stage of personality development, combining a period of high commitment and increased stress towards sport participation. 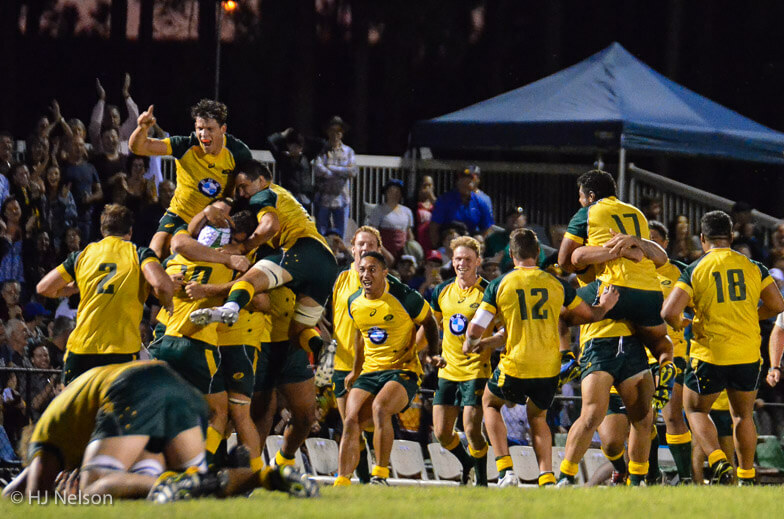 With Rugby Australia’s support, this led me to constructing a personal strivings research project amongst the strategically important cohort of players for Rugby Australia involved in Super 20 Championship of 2017, which shall provide a better understanding of what motivates, engages and drives these current young, elite Australian rugby players through investigating what players typically or characteristically trying to achieve on regular basis within the sport and on a personal level. These markers would be considered important remembering athlete burnout can result from chronically frustrated or unfulfilled basic physiological needs and previous research has shown the possession of and progression towards important life goals such as personal strivings are linked to long term well-being. The data was collected at two different stages; the first was during the high competition stage in last 3 weeks of Super 20 competition in March and second was on return to club environment in September after completion of U20 WC and Super Rugby commitments for some. In the first or highly competitive period of the season, it was shown that most involved players are more concerned with success, continuous improvement and setting or achieving identified levels of excellence within rugby, more so than improving personal well-being, happiness and avoiding challenges faced in sport. It is suggested from this research these players portray themselves as highly driven individuals, focused on perceived success within rugby and there was a substantially significant increase in answers mentioning personal health, happiness, appreciation and well-being when looking at identified non-sport specific goals, away from the rugby environment. Interestingly, players from all states involved displayed reduced numbers of intimacy and affiliation strivings in global/non-rugby specific strivings, suggesting once away from the goal focused atmosphere of rugby, their focus is less on approval, acceptance or concern for others around them and more driven for personal happiness, well-being and improving aspects of themselves. Around 80% of involved players intimacy strivings, which are goals that express desire for close, reciprocal relationships, were found in non-rugby specific daily activities, suggesting they seek stronger interpersonal relations away from their sport and have greater loyalty and responsibility to those involved in different areas of their lives when involved in high performance section of rugby season. An example of this was displayed in the answers offered from players aged 18 year old (some of the youngest in the programs), the term “respect” is used more frequently (15 x) than “fun” (4) and “enjoy” (8) across all strivings, which could be seen as the building of relationships and growing appreciation towards other coaches and players involved within the program or could be seen as failure of the program to combine enjoyment as part of ethos and environment alongside the development of players as individuals and success of states and programs. Psychologists such as Erikson support the belief that a key developmental trait of adolescents and early adults is forming intimate relationships and therefore, we as sports coaches and practitioners could be supporting this area of development within our practices and should be responding to the athlete’s expectations. The second data collection collected during return to club environment echoed trends found in the high competition phase; while these players are highly motivated and show high levels of achievement strivings, particularly in sports settings, intimacy and personal growth strivings such as happiness, meaningful, quality relationships and appreciation are heavily displayed away from rugby settings. Their achievement goals within rugby at both stages of the season were very much individualised and personally focused, looking to improve themselves and their capabilities as opposed to “winning” or collaborative success. Both data collections displayed the players recognising the coaches as a resource more than part of relationship, using affiliation terms and goals when mentioning coaches. It appears players relationships with coaches are concerned with seeking approval or generalising statements where players appear to be concerned with social group or playing squad acceptance. This works with previous research suggesting the importance of coach-athlete harmonious relationships and coach acting as a supportive element to player driven development and athlete autonomy. However, are we as coaches being too prescriptive in our approach as opposed to supporting player driven environments to help support these age grade player’s curiosity and imagination? Suggestions from collected data indicate that players in this elite participation mindset are looking for or requiring Vygotskian approach akin to Zone of Proximal Development approach like outlined below. However, previous research has shown high quality coach-athlete relationships, which are optimised by harmonious passion, result in higher subjective well-being within player (Lafrenière, 2008), an area which is critical for age grade player retention and development of self-determined motivations and mastery mindset. We need to ascertain what the player wants and expects from us to create an optimal learning and performance atmosphere. Coaches should assist players to identify problems as opposed to solving them, offering ideas and assistance for how to think and act as opposed to offering solutions. As Getzels and Csikszentmihalyi’s research addressed, creative people are driven by discovery and creation of problems as opposed to superior skills or ability. Therefore, coaches within age grade sports programs could adopt ideas from Vygotsky’s Zone of Proximal Development (ZPD), where this theory has the coach standing as a recognised more capable other to the athlete with their requirement being to engage in contextual collaborative and learning relationship with athletes to ensure optimal psychological functioning for maximal sporting performance. Zone of proximal development (ZPD) as defined by Vygotsky, is an area I believe would be successfully applicable to PYD promotion and specialising athletes in team sports such as rugby union. This theory encourages players to ask questions and adopt sub routines; therefore, the players are taking over the structure of tasks and practice while acquiring performance or transfer of performance. This again allows coaches to act as mentors, supporting players to develop meta cognitive skills where the athletes are aware of and take responsibility of appropriate practices and thinking strategies. This supports the ideas of learning being a series of episodes; scaffolding, where players identify and build knowledge, offering guidance through development by focused questions and positive interactions and allowing players to explore. These studied theories could be supported by Entwistle and Smith’s research (2002); this allows an athlete to explore personal understanding of subject or sport in question, assisted with relevant, timely and challenging feedback from coach or mentor. These theories promote the ideas of both learner/athlete and educator/coach to act, reflect, evaluate, plan and experiment prior to acting and starting the cycle over again. These processes offer both players and coaches security to adopt and test skills in preparation for competitive environment, understanding that all involved parties can reflect and plan new strategies if required. As opposed to a coach led or directive approach, it offers players autonomy to internally understand sport expectations and how they may offer new solutions or scenarios to develop mastery approach or elite status. Studies have shown that athlete satisfaction is related to the degree to which athletes understand their role and responsibilities within interactive sports teams. (Eys, 2007). The main aspects of influential and successful coach-athlete relationships revolve around ideals such as mutual trust, respect, support, cooperation, communication and understanding of each other and impact of each other within the relationship. Both performance enhancement and physiological well-being is deeply ingrained within the coach-athlete relationship. Coaches need to acknowledge and recognise the effects of positive, interdependent relationships, which are dynamic and interlinked with cognitions, feelings and behaviours to achieve common recognised goals (Jowett, 2007). Therefore, a coach’s ability to acknowledge and develop positive interpersonal connections, driven by interpersonal skills and united sense of purpose and achievement, can offer solid base for positive group climate. As in Positive Youth Development models, a coach should look to offer opportunities to continually develop strengths, improve performance and increase positive emotional states. What does this mean for us as coaches and leaders in how we should act to these adolescent athletes? Meaningful connections are key here. Engage on a significant and sincere level and teach our young athletes or leaders to do likewise. To look at relatedness, leaders and coaches should start by raising expectations for what is needed and expected from connections to others. In sport specific research, Chan and Mallett recognised that high performing coaches require additional skills including ability to facilitate functioning leader-follower relationships, revolving around emotional intelligence and empathy, beyond the standard technical and tactical skills (Chan, 2011). Jowett’s research into coach-athlete relationships looked at the interrelated emotions and behaviours captured through constructs of commitment, closeness and complimentary, tied in later studies with coordination (Jowett, 2004). In this sports research, commitment within coach-athlete relationships is recognised as intention to maintain a loyal, long term relationship while showing closeness as mutual trust, respect and appreciation for roles played in partnership. The coach’s and athlete’s ability to have mutual relatedness, common ground in beliefs and actions while having stress-free interpersonal behaviours displays coordination and complimentary aspects for successful coach-athlete relationships, something apparently missing during my discussions with my son prior to starting research. The challenge of successful coaching is acknowledging social interactive dilemmas within individual and team goal setting and development, offering suitable scenarios and choices with all members’ involvement and collaboratively dealing with matters as opposed to eradicating them. Past research by Mageau and Vallerand regards the “actions of coaches as (possibly) the most critical motivational influences within sport setting”. Coaching should be recognised as an educational dynamic relationship, where the coach can satisfy player’s goals and development but both sides have an investment of will capital, where human initiative and intentionally are both dedicated to show commitment towards goals and relationships. The role of performance coach for specialising late adolescent athlete is highly important. At this stage, coaches shall be “preparing athletes for consistent high-level competitive performance” (Côté, 2009a) through effective tactics such as integration of professional, interpersonal, and intrapersonal knowledge and developing player’s specific competence, confidence, connection, and character needs on regular basis. Therefore, understanding player personal strivings shall have positive impact on learning and development relationship. So again, do we actually know or understand fully what these young athletes want or need? Exactly what we want in return; passion, commitment, meaningful communications and relationships, support to choose and make decisions, following instinct while offering honest feedback on performance and support for a growth mindset; all things we must educate, support and train to others. I would like to thank my advisors Steven Rynne and Cliff Mallet from UQ for their patience, guidance and assistance in constructing, performing and presenting this investigation, Tristan Coulter from QUT for his advice and feedback on certain areas of study’s execution and involvement in milestones and Rugby Australia for their interest in this study, and the access and support they provided that allowed it to occur. We understand drive in most sporting participants is found from intrinsic motives; their internal desire to master their sports and challenge themselves through committed engagement in highly repetitive activities. Players when adopting a mastery mindset akin to Thurston shall be driven by constant and consistent desire to improve, focus on learning goals and have incremental theory towards sport specific knowledge and skill level. Players with mastery mindset will find intrinsic motivation and drive for the pursuit. JT’s displayed a growth mindset where he embraces challenges, put in maximum effort all the time to perfect his craft and worked hard with the players around him to share collective success, frequently putting his body on the line for team success such as his final game for Queensland. Former teammate Matt Bowen says “Johnno was a natural leader from the start, a young guy with loads of skill. And, man, was he competitive. You could see that by the way he launched himself into training drills. He had to be the best, even though it was days away from game-time.” Vealey (1986) recognised sports confidence as “belief or degree of certainty individuals possess about their ability to be successful in sport”. Within competency, previous research has showed success as determined by improvements from technical to tactical to performance based skills. I believe progression or development of skills to performance adaptation requires character growth, enabling athletes to adopt a mastery outlook, evaluate their performance and areas for improvement made possible from player confidence. Positive effect and player enjoyment was regarded as most important for the athletes; coaches should pay attention to this theme within player development. Positive effect and psychological impetus are regarded as drivers for enjoyment, which in turn would offer greater engagement to programs and sports. Cowboys coach Paul Green seemingly fit into the equation and offered environments to push himself in by understanding JT’s personal strivings, motivations and typical tendencies, subsequently offering consistent, critical yet non-controlling feedback and offer support and praise for effort, strategy and exploration of skills and abilities. Coaches need to offer and monitor accountability and feedback of control offered and adopted by players whilst encouraging player autonomy in learning and tasks, as autonomy leads to engagement, which results in drive for mastery. Coaches such as Green, Meninga and Henry’s involvement in Thurston’s success should not be ignored; studies recognised high levels of individual’s intrinsic motivations when coaches exhibit a leadership style that empathised training and instructional behaviours while exhibiting democratic behaviour rather than autocratic leadership styles (Amorose, 2007b). Applying Galinsky and Maddux’s research to sporting context would recognise that “taking perspective of (player) produced both greater joint gains and profitable individual outcomes”. In a sports context, this could be seen as improved coach-athlete relationships, regular player involvement in decision making processes, honest and accurate goal attainment for coach, player and playing group as a whole and personal development from all stakeholders. However, I believe a coach’s ability to use contrast principle, offering clarity by adding context, honesty and reasoning when offering perspective for dynamic and interactive coaching scenarios experienced and athlete relations shall reap long term gains and reciprocal commitment and closeness from athlete in return. My beliefs are echoed in past research including investigations by Mageau and Vallerand (2003); they believe coaches need to offer players opportunity for choice, acknowledge player feelings and perspective, limit controlling behaviours while valuing initiative, problem solving and involvement in decision making (Mageau, 2003). Leadership and ability to inspire other is another skill which help made JT a legend of the game. Even as a very young player, JT had an innate awareness that a team game often demands personal sacrifices, giving away his first Premiership ring to club captain Steve Price offering signs he knew this was the start of the journey for him, not the climax. Other NTH QLD Cowboys players such as Ethan Lowe and Kyle Feldt have come out and said how Thurston helped them overcome setbacks on the field and be part of the team’s success. Leadership defined is seen as the process whereby an individual influences a group to achieve a common goal (Loughead, 2005); leaders within team environments have been seen to drive and coordinate 3 main areas or functions being task related, social functionality and external obligations (Longhead, 2006). Northouse studies also advised of the components within leadership included processing and occurs in group context while involving influence and goal attainment. Thurston displayed a transformational leadership styles, which is seen as the ability to inspire and motivate followers to exceed performance expectations by shaping follower’s beliefs and attitudes. This form of leadership can be developed by inspiration or motivation to team members, through creating a vision of common goals, idealising influence through modelling behaviours or values, individualising consideration, through allowing for other’s needs and feelings and intellectual stimulation through encouraging creativity. This style is created by idealised influence by leading by example, showing optimism regarding team collective goals and setting high standards while acknowledging the needs of others and gaining cooperation through sacrifice (Bass & Avolio 1994). As we sadly watch the last NRL finals JT could have been a part of without his Cowboys side, I believe this shall not be the final time we see this champion player, leader and person. An emotional Michael Cheika came out this week, talking of his emotions and affects on his personal life after another Wallabies defeat to the All Blacks, making it a very uphill battle to win back the Bledisloe Cup last held in 2002. The heart on his sleeve coach has been the focal point of public backlash to the Wallabies' latest loss to the All Blacks and he said he didn't feel any added pressure to perform. Cheika said he was not concerned about the criticism, mainly because he is already his own hardest marker. Turning that negative into a positive is the only way to remain in the hunt for the Bledisloe come Saturday, at a venue where the Wallabies haven't won a Bledisloe Cup Test match since 1986. With the 2019 Rugby World Cup just over a year away, Cheika says he remains convinced the Wallabies are still on the path to success, even if it has contained potholes and rough patches. 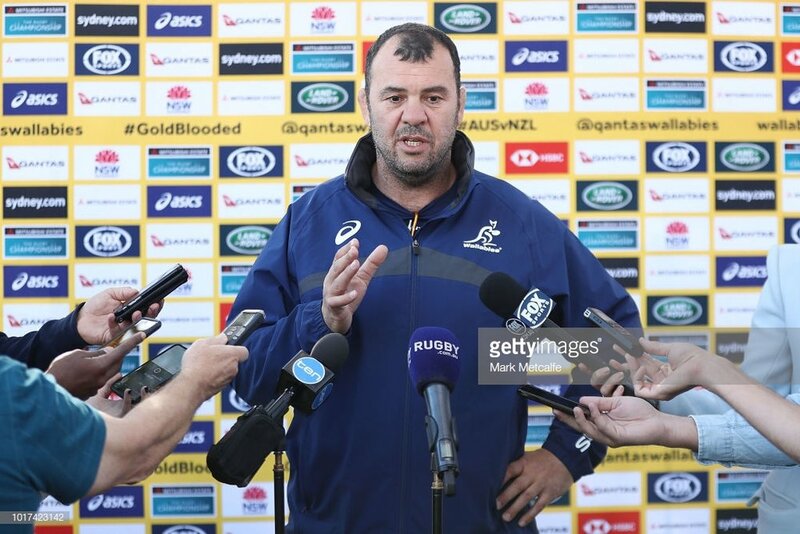 This lead me to look at the timing and tactics of Cheika's comments and address to the media; is he taking centre stage with the AUS press to allow his leading players to focus on and orchestrate their on field requirements? Coaches such as Cheika and his assistants need to learn to cope with ambiguity and difficulty of their role, overcoming a sense of legitimacy or validation and the perceived expectations of others, including the unrelenting media. The challenge of successful coaching is acknowledging social interactive dilemmas within individual and team goal setting and development, offering suitable scenarios and choices with all members’ involvement and collaboratively dealing with matters as opposed to eradicating them. Jones et all (2004) quotes coaching as “inherently fluid and multifaceted, militating against clean treatment, typified by pre-specification of a cumulative sequence of precise objectives and monitoring their achievement” (Jones et al, 2004). Other relevant research noted expert coaches could be recognised as highly adaptive in nature and adopt flexible planning strategies, relative to the context offered, quoted by Cote as “coaching expertise requires flexible adaptation to constraints” (Cote et al, 1995). Having coaches adopt supporting roles, such as the adopted role of Cheika dealing with media and absorption of perceived blame, allows them to support their “leading actors” being the Wallaby players through methods such as offering practical guidance with limited control, focusing attention on aiding development through decision making for players and practices from observations, evaluations with positive and honest feedback whilst displaying understanding and care towards players. This style of leadership would see the Wallaby coaches steering as opposed to controlling player's decisions and actions, encouraging player discovery through evolutionary planning and organising of tasks whilst keeping sight of overall objectives and showing empathy to get the best from the players. Coaches acting as orchestrators whilst attempting to create a successful pedagogic setting requires coordination of activities to investigate, monitor and respond with honesty to players. This may require some transparency from fellow coaches to offer rationale for processes. It may also require negotiation of processes with players to meet individual and collective performance measures of those being coached whilst matching evolving circumstances for learning and development against attempting keeping sight of overall objectives. Wallace (2001) looked at shared leadership through “promoting cultural transformation for followers through articulating vision of desirable future state, empathising dialogue, team work and mutual support”. Therefore, coaches shall look to incorporate a greater degree of follower power, gaining an overall system of collective relations between activities, agents and objectives. Offering player or athlete autonomy “positively corresponds to a number of desirable (player) outcomes” (Gagne et al, 2003); these include task perseverance through developed intrinsic motivation and physiological well-being. Protrac (2000) investigated ideas of coaching unobtrusively which allows players to informally focus on the Wallaby squad's playing objectives. Therefore, as defined by Gibb (1954), this form of leadership would be recognised as collaborative, “accomplishing group tasks with leadership as fluid (state) as opposed to fixed phenomenon”. This should enable intrinsically satisfying experiences for all involved, players and Cheika's coaches alike, enable personal development through informal and incidental learning opportunities and increased levels of skill and knowledge retention due to increased input into leadership. Studies have shown that athlete satisfaction is related to the degree to which athletes understand their role and responsibilities within interactive sports teams. (Eys, 2007). The main aspects of influential and successful coach-athlete relationships revolve around ideals such as mutual trust, respect, support, cooperation, communication and understanding of each other and impact of each other within the relationship such as Cheika's adopted role with the media. Both performance enhancement and physiological well-being is deeply engrained within the coach-athlete relationship. Coaches need to acknowledge and recognise the effects of positive, interdependent relationships, which are dynamic and interlinked with cognitions, feelings and behaviours to achieve common recognised goals (Jowett, 2007). Therefore, a coach’s ability to acknowledge and develop positive interpersonal connections, driven by interpersonal skills and united sense of purpose and achievement, can offer solid base for positive group climate. As previously mentioned, we recognise coaching as acknowledging social interactive dilemmas within individual and team goal setting and development, offering suitable scenarios and choices with all members’ involvement and collaborative dealing with matters as opposed to eradicating them. Lemert (1997) discussed that coaches “define themselves and their role by their perception of what it means to be a coach with the influence of occupational socialisation and subculture, which provide a sense of others expectations”. However, as explored through previous research mentioned in this article, it is believed coaches whom relationships with players respect their knowledge or expertise in athletic or sports based contexts, cultivate learning without exercising legitimate power and do not influence social aspects or relations can lead to new shared understandings with their athletes. Therefore, I perceive that Cheika took this action of putting himself under the spotlight as opposed to supporting staff or players to allow their focus to be on winning the Bledisloe Cup back; we'll see on Saturday night! As the NFL preseason is drawing to a close and re-listening to a 2016 podcast with Pete Carroll, I needed to dig further into what he does and why. Extremely successful, Carroll is one of only three football coaches who have won both a Super Bowl and a College National Championship and is the oldest head coach currently working in the NFL. However, his attitude to relationship-based coaching, focusing on being present and recognising moments and helping others optimism and drive made me want to compare further ideas against athlete led versus coach led approaches, something he touches on in this "Finding Mastery" podcast. It is believed that it is beyond the capacity of any coach (or person in senior management or leadership roles in my opinion) to achieve full, predictable control over leadership and development processes. Therefore, coaches need to learn to cope with ambiguity and difficulty of their role, overcoming a sense of legitimacy or validation and the perceived expectations of others. The challenge of successful coaching is acknowledging social interactive dilemmas within individual and team goal setting and development, offering suitable scenarios and choices with all members’ involvement and collaboratively dealing with matters as opposed to eradicating them. Jones (2004) quotes coaching as “inherently fluid and multifaceted, militating against clean treatment, typified by pre-specification of a cumulative sequence of precise objectives and monitoring their achievement” (Jones et al, 2004). Other research noted expert coaches could be recognised as highly adaptive in nature and adopt flexible planning strategies, relative to the context offered, quoted by Cote as “coaching expertise requires flexible adaptation to constraints” (Cote et al, 1995).